Let us take a look at the eye of Hurricane Jose, as imaged by the European Sentinel-2A satellite on September 9th, 2017. The quick wiggle motion of the animated GIF above can create a 3D effect, give it a little time, for some people it takes a moment. This effect is called Wiggle stereoscopy. 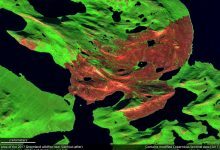 But even if you – like I myself – have problems seeing a 3D effect, these Sentinel-2A images can tell you a few things about the way Sentinel-2 is taking a look at Earth. In the top left corner you can see that the animation consists of three images, it uses band 4, 3, and 2, the red, green, and blue band of the MultiSpectral Instrument (MSI). The interesting thing about it is, that unlike a usual consumer digital camera, the sensor in the MSI takes those images one after another, and these little temporal differences are enough that the resulting images change because of tiny differences in the viewing angle as well as the movement of the target itself. Now take a look at this slower version for a moment, then read on. This version is slow enough that you can see the expected anti-clockwise rotation of the hurricane. And in case you are wondering, the time difference between the band 4 image and the band 2 image is 1,005 milliseconds, so just above a second. Take a look at it again for a little moment, then read on. The MultiSpectral Instrument aboard Sentinel-2A doesn’t just use one sensor, but has a number of detectors (12 each for VNIR and SWIR). Those two sets of 12 detectors are aligned in two rows each, the odd and the even detectors. The interesting thing about those sets of detectors is the fact that the order in which images are taken is the exact opposite in the odd and even detectors. To take the whole sequence of 13 images the detectors need 2,586 milliseconds, so about 2.5 seconds. Since this animation begins with band 4 and then shows band 3 and band 2, we see the images of the even detectors in the right temporal order, leading to the correct anti-clockwise depiction of the hurricane’s rotation in the middle part of the image, imaged by an even detector. The outer parts of the images, however, were imaged by two different odd detectors, and since their imaging sequence is reversed you can see a clockwise rotation of the hurricane. What about the eye wall? That doesn’t explain the big change in the viewing angle of the southern part of the eye wall though. Now, because it takes the detectors a moment to take an image in each band, the images are calibrated for ground level geometry, so that every band is showing the same spot on Earth, even though taken at slightly different times from a slightly different angle because of the motion of the satellite while orbiting Earth. If you have objects at high altitudes though, such as the hurricane’s eye wall or any clouds for that matter, their relative angle to the satellite will change quicker because of their shorter distance to the satellite, leading to this visible effect. The images are calibrated for ground level geometry and you get parallax errors for objects at this heights, leading to an offset between the different channels. You will probably have seen this offset many times in the form of clouds showing red, green, and blue edges, or contrails separated into red, green, and blue. The image on the right is an example of a high-altitude parallax offset, in this case a contrail. It also happens to cross a detector boundary, causing a band order reversal. 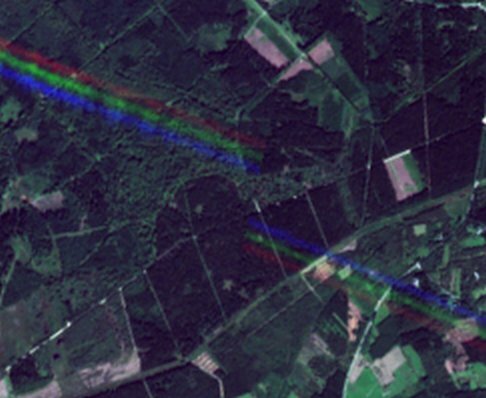 The striping you surely have noticed in some Sentinel-2 images is also caused by viewing angle differences, odd and even detectors have a slightly different viewing angle – enough to cause the striping. Another effect causing visible striping is a spectral response non-uniformity near the detector boundaries. If you are interested in those image artifacts you can find more on it in the second source listed under “More”. Now that you know that the temporal difference between the red and blue channel is about one second, it is pretty straightforward to estimate the speed of any object fast and large enough to create an offset in those channels, most likely planes and helicopters, but sometimes it is even possible for ships. 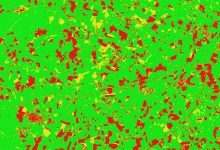 The difference in the order of image-taking by the odd and even detectors might answer your question why the offset images of planes and other fast-moving objects sometimes appear in the order red-green-blue and sometimes blue-green-red in the direction of movement. This can also help you determine whether this part of an image was taken by an odd or even detector. Can you take it again? Some people told me they have problems seeing the motion in the monochrome version of the GIF, so here is a version with a meaningless color gradient and no other difference, just to enhance the visibility of the motion. I would like to thank Manos Lagoudakis for relaying my questions regarding some of the technical aspects of the Sentinel-2 satellite to the Sentinel-2 mission technicians. Sentinel-2 ESA’s Optical High-Resolution Mission for GMES Operational Services (PDF) for some general information on Sentinel-2 and the MSI. ESA S2 MPC Data Quality Report (PDF) for some very interesting details of the MSI and explanations of image artifacts you might have encountered.